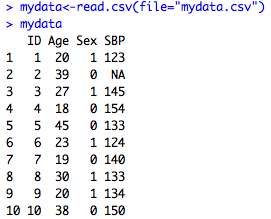 One of the great advantages of R is that it recognizes almost any data format that you can throw at it. There are a myriad of different possible file formats but I'll concentrate on the four files that we see almost exclusively in public health: Excel files, Stata .dta files, SAS transport, and sas7bdat files. Luckily, there are a few packages that can help to import and export these files. There are options for not maintaing first line variable headings (Header=FALSE), but I can't really think of a time that you would want to do that. You can also change what symbol is delimiting your data (tab delimited for example with sep = "\t") , but again I have never used those options. If you're in need of those options, you can read about them here. 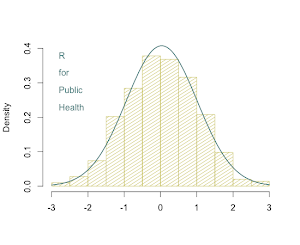 As you see on the left, R will automatically convert missing cells to NA, meaning that it's a numeric variable. If you have periods or something else that indicates missing in your CSV file, you could do a find and replace of the csv file for periods and change them to blanks. Or with an apply() statement. Check out my earlier blog post about this. Back to importing: If you get an error like the one you see to the right, 99.9% of the time you have misspelled the name of the file or put it into the wrong folder. Always check to make sure the directory name and the file name match up and all your slashes are in the right place. However, I have personally had some problems with this function not working for me. Hopefully it will work for you. If it doesn't, you can try to convert the SAS file using StatTransfer or with JMP if you don't have SAS on your computer.